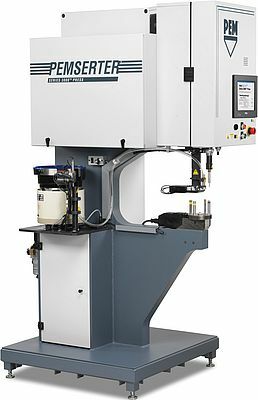 Installing all types of self-clinching fasteners rapidly, accurately, and permanently in thin-metal sheets without utilizing hydraulics, the PEMSERTER Series 3000 automatic fastener-installation press system from Penn Engineering is sealed and lubricated for life to eliminate environmental issues and minimize maintenance and associated costs. At its heart is a custom-built, full servo controlled, electro-mechanical actuator, which delivers measurable efficiencies and economies compared with conventional technologies. The dual axis actuator allows for ram speed optimization, high pressing forces, and reduced energy usage. A proprietary clutch system provides smooth, energy-efficient transition between servo axes. The roller screw technology enables the press to carry larger loads at higher speeds, while regenerative/dynamic braking captures inertial energy and applies it to deceleration for a reduction in external energy requirements. After initial PC setup, all run logic is maintained in solid-state servo controller memory, which consumes less power than conventional systems. Multiple types of self-clinching fasteners can be installed automatically without any need for tooling changeovers. Designed with a 61cm throat depth, the press runs at high cycle rates, can realize a ram force up to 71.2kN, and can be operated remotely through networking. It is CE certified to comply with applicable European standards.